Chimborazo is the highest mountain in Ecuador, and is the postergirl of this reserve. The giant measures 6,310 meters above sea level and its upper slopes are by a vast bleak wasteland. This reserve, however, provides water to the three provinces below, borne from the Ambato, Chambo and Chimbo springs. Chimbo's waters end up in the great river Guayas; a link recognised in the national coat of arms. The connection between the Chimborazo and Guayas River is a symbol of unity between Costal and highland regions. The reserve is home to a large population of vicuñas reintroduced from Peru and Chile in 1988. There are also llamas and alpacas, native domestic animals which were used by the ancient inhabitants of the Andes before the Spanish introduced horses, sheep, cows and donkey. The reserve was created to protect these animals and its historical legacy as well as the strange wasteland of which they are part. Take the Panamerican Highway to the city of Ambato. From here continue along the Ambato - Guaranda road that crosses through the reserve. 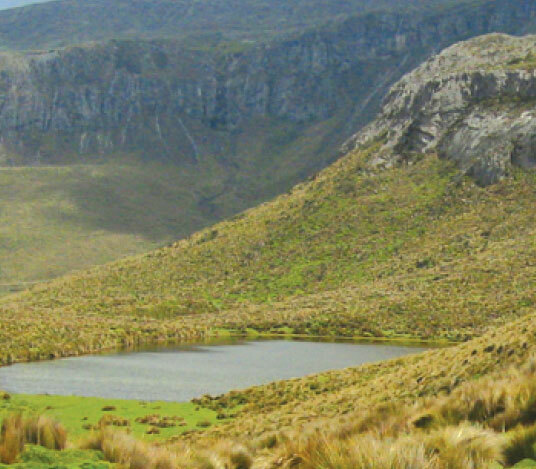 Take the Riobamba - Guaranda road for 30 km until you reach the entrance to the reserve. Guardianship Arenal - inside of the reserve. Riobamba - Guaranda route. Provincial Directorate of Environment of Chimborazo. 9 De Octubre and Duchicela, Macají sector. Riobamba. Chimborazo province. The vast mass of Chimborazo, with its three undulating humps, is visible from many parts of the Sierra from different angles. From the Panamerican highway you can see it to the west and from the Ambato-Guaranda road you can see it in east. If the way to measure the height of the mountains were not from sea level but from the center of the Earth, the Chimborazo would be the highest in the world. The Earth is flattened at the poles and elongated in the middle, which makes the Chimborazo (which is very close to the equator) outperform other huge mountains that are further away from the equator. Refugio Hermanos Carrel and Edward Whymper. Access to clean shelters with added value depending on what you're planning to do. 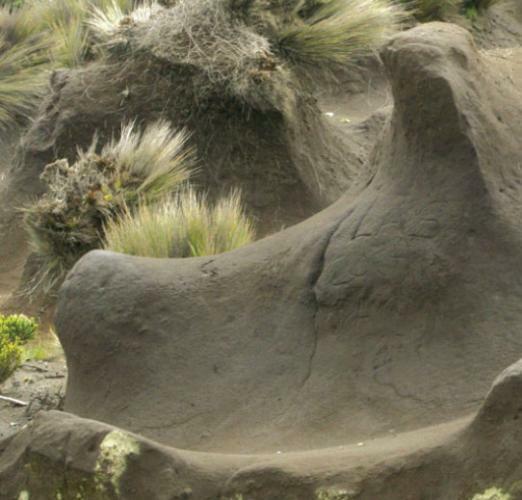 Value-added facilities are on offer if you are planning to summit the volcanoes. Refreshment available for day visitors if you are just planning to have a look. Artisanal handicrafts, and comunity involvement in the running of the reserve. Paths The Hieleros. With an area of 11.6 kilometers, this trail runs fromCuatro Esquinas (Four Conrners) area to Mias de Hielo (the Ice Mine). You can take the route used by the hieleros to bring ice from Chimborazo to Riobamba. A guide is required to on this 'medium difficulty' trail. Machay Temple is 4,560 meters above sea level. This site consists of a large pyramid shaped rock and has a cave entrance where people come to make requests and offerings to the mountain. It's an 8 km trail from Chorrera Mirador to the Machay Temple. The tour is of medium difficulty and requires a guide. Path from first to second shelter. This is an advanced mountain route, and required an experienced mountaineer guide. The route links the two shelters of Chimborazo and ends at the top of this mountain. The first recorded attempt to reach the top was made by Alexander von Humboldt in 1802. In this ascension he was accompanied by French botanist Aimé Bonpland and Carlos Montufar Quito, and they reached 5,878 meters. The first successful ascent to the top was made by the english expeditionist Edward Whymper, accompanied by the Italian Carrel brothers. Chimborazo has four summits; Veintemilla (6,227 m), Whymper, the highest point (6,310 m), Politecnica (5,570 m) and Nicolas Martinez (5,570 m), named in honor of the father of mountaineering in Ecuador. Within the reserve, 38 indigenous and peasant communities live. 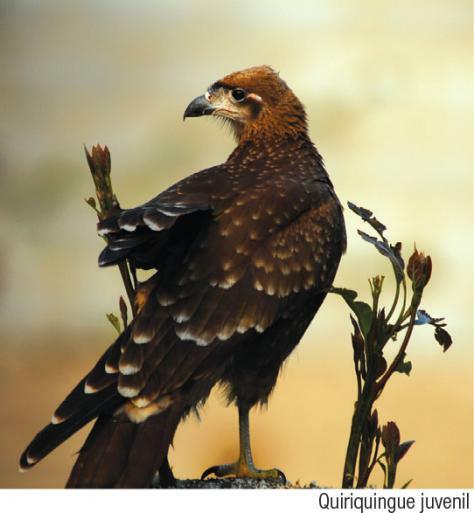 The communities cultivate potatoes, beans, barley, mellocos (a root vegetable) and geese in the lower parts of the reserve and graze animals in the highlands. They was the 'hieleros del Chimborazo'; people who used to cut large blocks of glacier ice wrapped in straw and transport them to Riobamba and to the coast. The ice was used to make slushies and juices. Today there is just one "hielero", which you can accompany to do his work. The particular ecosystem that surrounds the vast mass of Chimborazo owes its relative dryness, among other things, to the mountain, which acts as a barrier called "sombra de lluvia" (rain shadow), trapping moisture from westerly winds. Only a few clouds manage to escape and unload on the other side. The Altar and Sangay mountains, which are on the eastern end of the mounrain range are much more influenced by the Amazonian humidity than Chimorazo. Although Chimborazo is dry, there are flooded areas where el caballo chupa and almohadillas grow. Other typical plants include native grasses,, the ñáchag with its small yellow flowers, chuquiragua or climber flower,orejas de conejo (rabbit ears), the romerillo, the Sunfo and ashpachocho. There are also trees like kishwuar and paper trees that form small wooded areas. Llamas, alpacas and vicunas roam the sand and desert. There are also deer, chucuris, paramo wolves, rabbits, cougars and opossums. Condors fly overhead, while curiquingues prefer to stay close to the ground. There are also hawks, ligles, tanagers and hummingbirds, among which is Esmerelda Woodstar of Chimborazo. Waterfowl like ducks and gulls appear in the wetter areas, together with marsupial frogs and Cutin frogs . Reptiles complete the diverse wildlife of the reserve. The mountain is the main attraction of the reserve. The peak is massive, impressive and imposing. You can ascend either from Riobamba and Guaranda. Several naturalists visited the mountain in the eighteenth and nineteenth centuries, including Alexander von Humboldt, who left us drawings which compare the vegetation observed at the different altitudes of Chimborazo and Cotopaxi. That study is now considered the basis for the geobotany, a science that studies the distribution of plants on Earth. 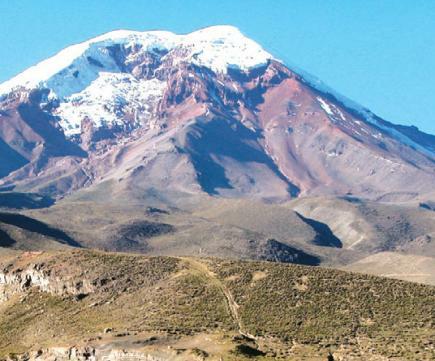 The Chimborazo is surrounded by a vast dry wasteland known as 'El Arenal'. 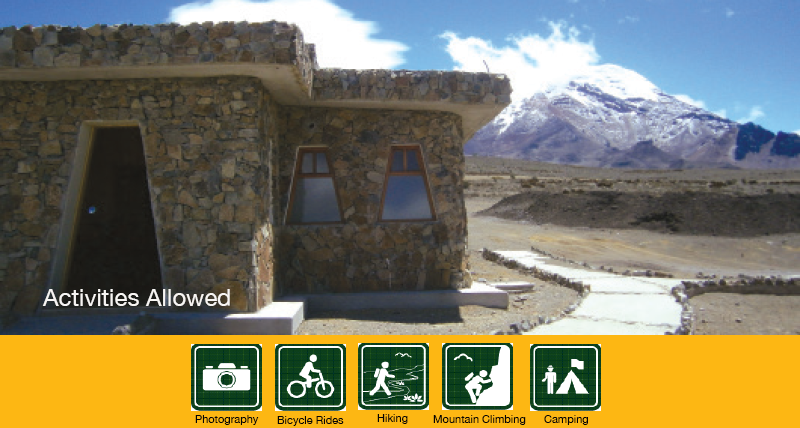 It can be visited via the Guaranda- Riobamba road that circles the mountain and the Ambato-Guaranda road. 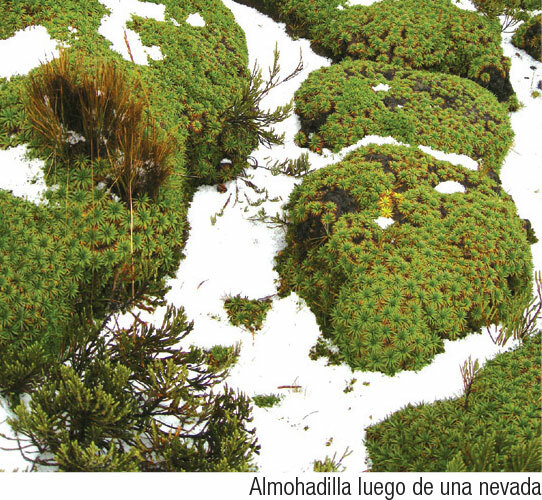 This ecosystem is the result of geographical and climactic conditions that unique to Chimborazo. " Herds of vicunas seen in communities Pulinguí, San Pablo and Chorrera Mirador. 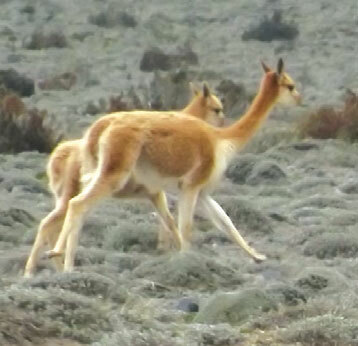 South American camelids (vicuñas, llamas, alpacas and guanacos) are perfectly adapted to the wilderness of the area. Their hooves have pads, so when they step on the fragile and spongy soil they do not copmact it, as cows and horses do with their with their hard hooves. When feeding, they also manage to do so without destroying the vegetation of the moor, unlike sheep. Carihuairazo is another mountain in the reserve. The peak measures 4,900 meters altitude and has a crater two kilometers in diameter. It is visited by climbers toa climatise to the altitude before climbing higher mountains and volcanoes. Clothing. Warm clothes, rain poncho sweater or raincoat in case of rain or drizzle. Proper footwear, good walking boots if undertaking if medium or long walks.